Cart66 Cloud wants to verify that your WordPress plugin is installed and reachable to make sure everything will run smoothly. After you install the Cart66 Cloud plugin, log in to your Cart66 Cloud account and look under Setup => WordPress Plugin. There you should see a button to verify your plugin. If you run into trouble verifying your plugin, here are some tips. If you are having trouble verifying your plugin here are a few common problems that may help you figure out the problem. First, make sure your site is publicly available on the internet. Otherwise Cart66 Cloud won't be able to connect to your site to verify that your Cart66 Cloud plugin is installed and activated. Make sure that in your Cart66 Cloud account (not your WP Admin) you have the correct settings for your store URL. Make sure your Store URL is set to the root of your WordPress website. The URL should be something like http://mysite.com Even if you have a dedicated page or section of your website for your products like http://mysite.com/shop you should still use http://mysite.com for your Store URL. Do not use a sub-directory or any other path. If you have a plugin installed that puts up a "coming soon" page or if your theme has a "coming soon" feature that gives you a nice landing page but blocks access to all the other pages of your site you will need to temporarily disable that feature so Cart66 Cloud can verify your plugin is installed and the communication between your site and Cart66 Cloud is working. This also applies to down for maintenance pages, password protecting your site or anything that blocks public access to your WordPress site. Doing the above two things solves most of the problems. If you still have trouble, check to see if you can access the Cart66 Cloud page slurp template on your WordPress site. The page slurp template is a virtual page which means that it is not in your database so you won't see it in the list of pages in your WordPress admin. If you don't see a page like that then you can try picking a different page template to use for your page slurp template. Cart66 Cloud tries to pick a full-width page template if your theme provides one. Sometimes the page template the Cart66 Cloud selects is the best one and you will want to pick a better one. We recommend using a full-width template (without any sidebars) if you have one. 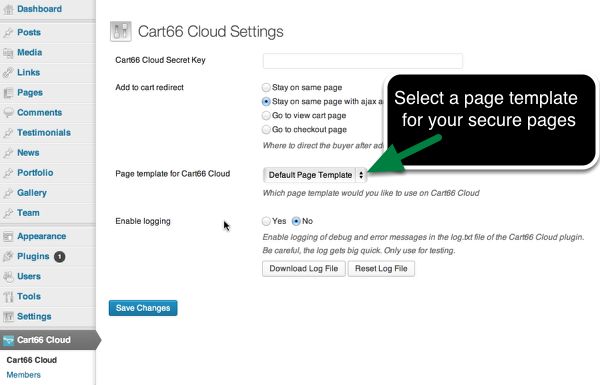 To pick a page template for Cart66 Cloud to use for your secure pages, log in to your WordPress admin and navigate to your Cart66 Cloud settings. To solve this, either deactivate the Post Types Order plugin, or you can modify the plugin. We have already contacted the plugin developers and have given them the patch described below. This update should soon be included in their official plugin. In the meantime, here is the update. So the function looks like this now. If that solves the problem then there is a conflict with one of the installed plugins. You can activate each plugin one at a time and testing the page-slurp-template after each activation. When you activate the plugin that breaks the page slurp template you have found the offending plugin. If all else fails, the problem could be in your WordPress theme. 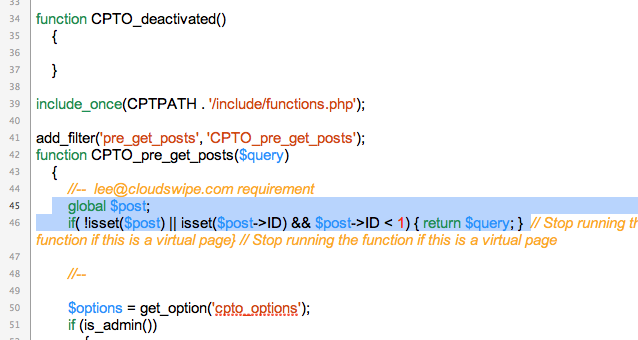 Sometimes themes have built in functions that may include plugins or do things that might conflict with Cart66 Cloud. To determine if the issue is with the WordPress theme, temporarily deactivate your current theme and activate the default Twenty Twelve WordPress theme. If that works, then at we know there is an issue in the theme - and the first place to look is the theme's functions.php file. In some cases, the plugin won't verify because the IP address that your web host is using to host your website has been flagged for malicious activity. This is not your fault. This happens because hosting companies like GoDaddy and Bluehost offer really low cost hosting and have a great number of websites all sharing the same IP address. If any of the sites host malware, send huge amounts of spam email, have bots, viruses, etc. then the IP address gets flagged. Being on a server that hosts sites like this is going to be bad for your site's overall performance and security. Our recommendation is to look into improving the hosting solution for your website in general because having an IP address flagged for malicious activity will have a negative impact on many aspects of your site including security, server performance and email delivery for emails sent from your server. If you want to stay with your current hosting company, you can ask them for a dedicated IP address which will get your site off of the IP address that has been flagged. Having the new IP address will allow your site to connect to our servers. If you need help determining if you website's IP address is flagged, please open a support ticket. Alternatively you can look up the IP address and use monitors such as this: http://www.alienvault.com/apps/rep_monitor/ip/66.147.242.175.